The previous central government brought a Street Vendors (Protection of Livelihood and Regulation of Street Vending) Act, 2014 for protection of livelihood rights and social security of street vendors. A government press release quoting the Minister for Housing and Urban Poverty Alleviation at that time said, ‘Vendors try to solve their livelihood issues through their own meagre resources and sweat equity.’ It was provided that no street vendor will be evicted until a survey of has been completed and a certificate of vending has been issued to vendors. A Town Vending Committee, comprising of at least 40% vendors, was to carry out the survey and allocate space for vending to vendors. Relocation was to be exercised as the last option only if there was urgent need for the land in question. If the vendors were to be evicted their livelihood and standard of living should have improved compared to their pre-eviction level. The Act was supposed to protect street vendors from harassment by police and ensure they carry on their business without the fear of harassment by the authorities under any other law. No zone was to be declared no-vending zone until such time as the survey had been carried out and plan for street vending had been formulated. The Act was to create a conducive atmosphere for vendors to do their business with dignity. 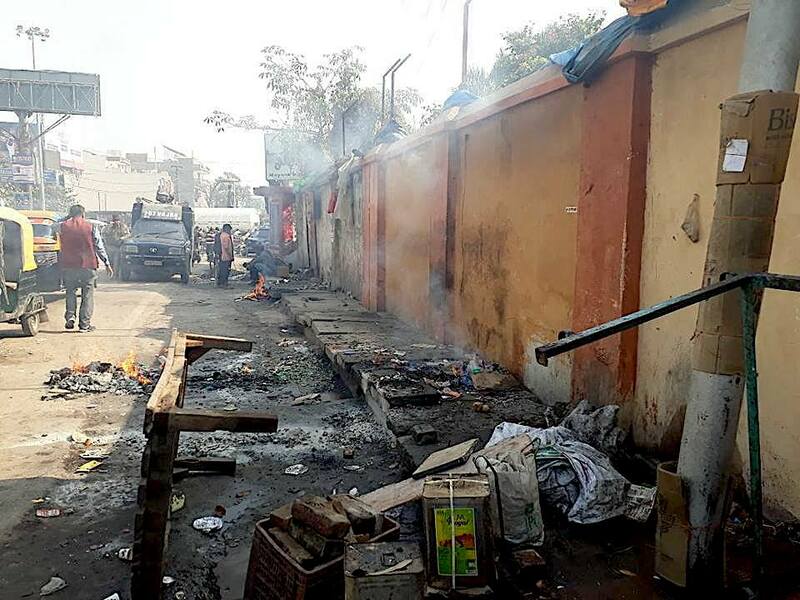 Yet on 23rd December, 2017 in the Prime Minister’s constituency, immediately outside the Banaras Hindu University, which is PM’s favourite landing spot on his visits to his constituency, about 45 vendors in Lanka market were brutally assaulted by the police which swooped down unannounced with JCB machines and destroyed the trolleys, material items and other belongings of vendors who sell tea and other food items to patients admitted to Sir Sunder Lal Hospital and their attendants inside the Univeristy campus on the other side of the boundary wall. The vendors used to set up their trolleys on cement slabs covering a drain which goes along the boundary wall of the University. The University used to charge a fee from them for using the space long time back. The vendors have preserved the receipts. So, it is clealy not a land belonging to Municipal Corporation or the District Administration. In violation of all the nice provisions of the 2014 Street Vendors Act the police of Varanasi Distrct Administration bundled the vendors causing them physical damage, monetary loss and public humiliation. The stoves were broken and wooden carts were burned. This is not the first time police has taken such an action. Whenever the PM, who considers it a matter of pride to declare himself a former tea vendor, is in Varanasi the vendors are told to clear the area. But after PM’s visit they were allowed to set up shops again. The brutality of the 23 December attack is inexplicable. It has brought out the anti-poor nature of Bhartiya Janata Party governments once again and raises questions over PM’s claims of ever having sold tea. The action of the local administration is clearly illegal. A number of complaints have been made to the PM’s office about the hostile behaviour of local administration towards vendors but to no avail. As soon as the vendors were removed the space was occupied by the autorickshaws which take passengers from BHU to Diesel Locomotive Works, a unit of Indian Railways, or Mandudih Railway Station. There is a flourishing exortion racket in Varanasi (and in other cities as well) where about Rs. 18 crores per month in collected from autorickshaws and vehicles which carry patients from nearby areas to the BHU hospital and back to their homes. The actual tender for autorickshaw stands given out by Varanasi Municipal Corporation for different spots in the city is only for Rs. 30 lakhs per month. Huge amount of illegal money is shared among officials, politicians and middlemen. At the BHU stand the contractor for the stand is supposed to take only Rs. 5 per day from an autotickshaw but the actual rate being charged is Rs. 15. The vendors, more aware about their rights and willing to struggle for them, had refused to pay any extortion money to the police. The contractors managing the autorickshaw stands are too happy to grease their palms. Hence the police carried out the operation agains the vendors with vengeance and has clearly taken the side of autorickshaw operators. A reply from Municipal Corporation under the Right to Information Act says only ten autorickshaws are allowed to be parked in either direction outside BHU main gate at any time. However, hundreds of them are seen to be stationed there waiting for their passengers. Hence the message is clear. Even in the PM’s constituency, who is hailed as possessing zero tolerance for corruption, the local administration will protect the interests of those who pay bribe. It is willing to go to the extent of even flouting a national Act for this purpose. The Modi-Yogi governments, in spite of their tall claims, have not even made a dent on the systemic corruption. If anything the system of favours and commissions has only strengthened with the rates gone up. The president of the Vendors’ Welfare Association at Lanka, Chintamani Seth, who is also in court against the government and administration related to previous such eviction many years ago, says he has never felt so humiliated in his life. Chintamani has valiantly fought against the police on previous occasions and has even been to jail. He is a tea vendor too, but clearly not as fortunate as Narendra Modi.